This dramatic deep two frame mosaic depicts a rarely photographed region of the Virgo Cluster of galaxies. Both galaxies were included by Charles Messier in his 18th century collection of objects that are not comets. The one on the right is M89 and the one on the left is M90, both are between 50 and 60 million light years away along with the small companion of M90, IC 3583. 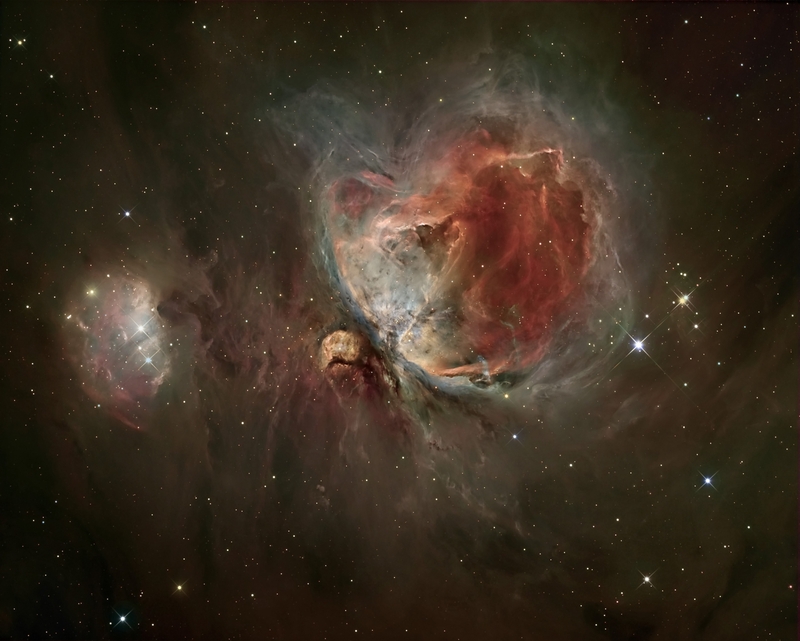 You would almost be tempted to think that M89 and M90 are interacting but they are not. The reason for ionized filaments in M90 is because of a process called ram pressure stripping, which removes the gas, is quite common in the Virgo Cluster and other galaxy clusters. Last edited by markh@tds.net on Tue Mar 20, 2018 7:57 pm, edited 1 time in total. It shows the wide conjunction of the Moon, Venus and Mercury, taken from a beach near Koksijde, Belgium. happy march equinox for apod and all his followers!! Thank you, this is a fantastic image! I found another superb galaxy image on your homepage, centered on the blue spiral galaxy pair NGC 4411. 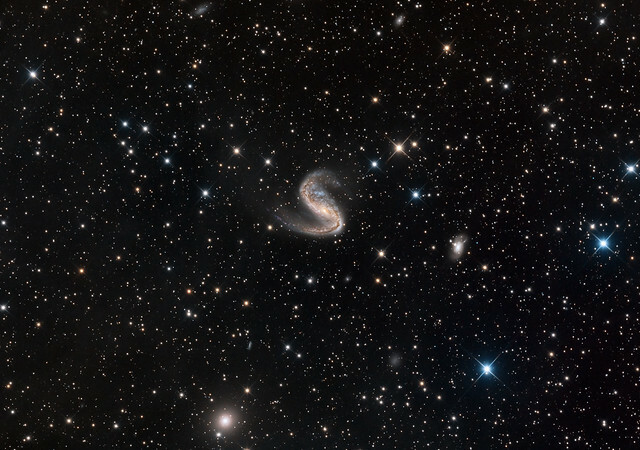 According to my software, the two components of NGC 4411 are a real pair, at a distance of 56-57 million light-years. 1023.jpghappy march equinox for apod and all his followers!! Happy equinox to you too, and thanks for all the great pictures you have posted here! 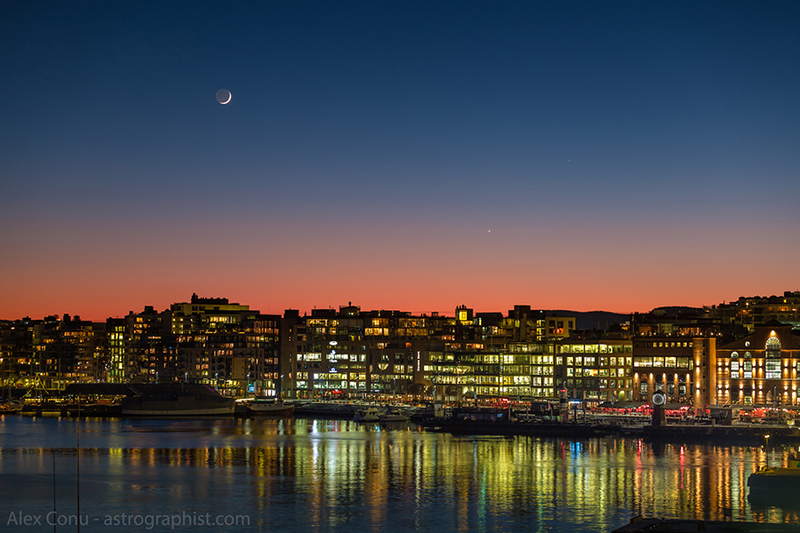 Here’s a photo of the Moon, Venus and Mercury above the neighbourhood of Aker Brygge in Oslo. After a thorough renovation, the area has a fresh look and lots of new restaurants and shops. At street level Aker Brygge is a vibrant commercial district, and the large open-air areas and indoor shopping street are often used for photo exhibitions, concerts and pop-up events for fashion, art and culture. For more than a century Aker Brygge was the site of a shipyard, Akers Mekaniske Verksted. The architecture at Aker Brygge is distinctive, with its combination of old, venerable shipyard buildings and modern architecture. Shot last night with a Canon 6D and a Canon EF 70-200 f/2.8L lens. I also used a NiSi gradual filter to better balance the exposure throughout the frame. The colours were splendid. Mars passes the "Galactic Gate" of Trifid and Lagoon! NGC 2442 - The Meathook Galaxy. 56 million light years away, in the constellation of Volans, there is a dramatic lopsided intermediate spiral galaxy known as the Meathook Galaxy. Its asymmetric shape has one arm tightly folded in, while the other is dotted with star forming regions that extend far out from its galactic nucleus. These regions are trailing off to the left on the lower arm, and have a slightly pink and reddish colours. The galaxy itself is around 110,000 light years across and is moving away from us at 1466 kilometres per second. I have always enjoyed looking at interesting shaped galaxies as usually have an interesting history. In this instance, around 200 million years ago, there may have been a gravitational interaction with the fuzzy galaxy to the lower right, AM 0738-692. If you look carefully, there is a fairly easy to spot almost edge background galaxy, around the two o’clock position. Within inner region of NGC 2442, there is a background galaxy just popping through. I had to resort to some Hubble images to verify, and there it was. That is so cool to be able to see a galaxy through a closer galaxy. To locate it, draw a line from the core, moving outwards toward the 4:30 clock position, and there is what looks like a horizontal line perpendicular to the line you have just drawn out. It is very subtle. Another feature to help locate it, look at the ends of a forked brownish structure that connects back to the core of the galaxy. There are quite a few dim, far off galaxies throughout the frame. In a couple of days, the Chinese space station Tiangong-1 will fall back on Earth. Before this happens, I took advantage of several Lunar transits visible in my area to immortalize this dying space station. This one was taken on February 26th, 2018, from the side of a road (it's important to be as close as possible to the line of centrality of the transit) between Phoenix and Saguaro lake. The transit lasted less than half a second (0.4sec) and the space station had an angular diameter of only ~7" (that's about 1/5th the angular diameter of Jupiter). Still, the solar panels are visible on this image. The difference in size is even more striking when you know that Tiangong-1 was only ~300Km away while the ISS was 450 Km away. Speaking of distance, how can amateurs measure the distance to things like Tiangong-1 or the ISS? Simply by taking a (series of) picture(s) of these objects from two different locations and using the parallax method to measure the distance. I wanted to test this method. So, on March 3rd, my friend Tom Polakis and I drove outside of Phoenix to record a lunar transit of Tiangong-1 and we setup about 400 meters apart from each other. 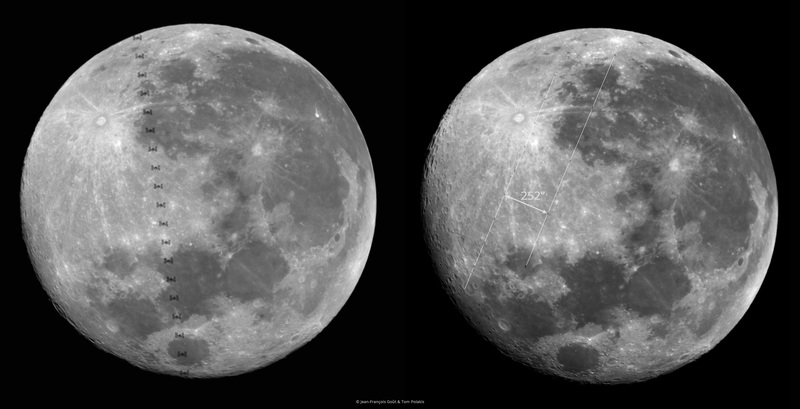 We both recorded the lunar transit of Tiangong-1 and as one can easily see from the image below (right-side panel), the position of Tiangong-1 relative to the Moon was quite different, even when observed from only 400 meters apart. Based on the position of the two observers (33° 30' 03.07" N 111° 37' 04.75" W for Tom and 33° 30' 16.60" N 111° 37' 02.45" W for myself) and with an angular distance of 252" between the two observations, one can conclude that Tiangong-1 was 286.5 Km away from us at the time it was passing in front of the Moon. The true distance given by calsky.com was 292.6 Km, so the parallax method works and gives a pretty accurate result. To make it easier for people to make similar observations and the corresponding calculations, I made the code that does all the calculation available on github (https://github.com/jfgout/parallax). With this, even people who don't like maths can do this type of measurements. 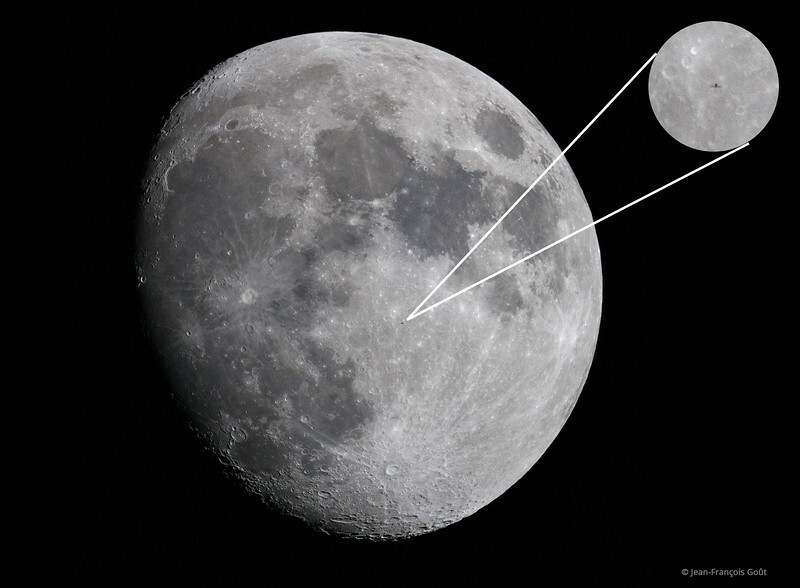 Note that it can also be used to measure distance to the Moon by taking pictures at the same time from two places on Earth (ideally >1,000 Km apart for more accurate results) and using the background stars as markers, or even near Earth asteroids (successfully tested on (3200) Phaeton recently). Copyrights: Jean-François Gout (http://www.jfgout.com) and Tom Polakis (http://www.pbase.com/polakis/) for the last image. Last edited by jfgout on Thu Mar 22, 2018 6:15 pm, edited 1 time in total. Sometimes you should just quit whatever you are doing, take a break, sit back, look up, and just enjoy the nature that's around you. On March 16 2018 at the Aurora Borealis Observatory in Senja, a huge aurora burst gave birth to a bright and widespread corona, after which it transformed into an pulsating one. During this typical phase of a substorm, the aurora is less bright and colorful, but it pulsates back and forth like a strobe light. If you have never experienced it, I suggest you do because it's as mysterious and eerie as the usual aurora. It really gives pastel colors to the sky, and invites you to lie there and just contemplate this natural show. Some could see a huge green saucer, others could easily see an enormous green whip from the north or even a green Atlas. What I saw on February 17th was a giant green eye lighting up the Skaland bay on Senja island, Norway. I was just about to pack up my bags because the solar data was not cooperating, and as I was almost done wrapping everything up, an extremely bright yellow flash came out of nowhere from the north-west Norwegian sea. At first I actually thought it was one of those bright spot lights from fishing boats that go on all night, but as it extremely quickly developed across the sky, I began to understand what was happening. But this really was unlike any aurora I have seen. Some of the brightest outbreak produced some of the weirdest and mind-boggling shapes I had ever seen. The bay of Skaland in the northern fjords of Senja is one of the best places to admire the show since there is almost no light pollution and a 300 degree view. I was lucky enough to witness some of the craziest coronas that night (4 consecutive) and they went on for hours until the show entered the pulsating phase. We are about midway through the Orion season and it's crazy to see Orion already risen in the sky when night falls. 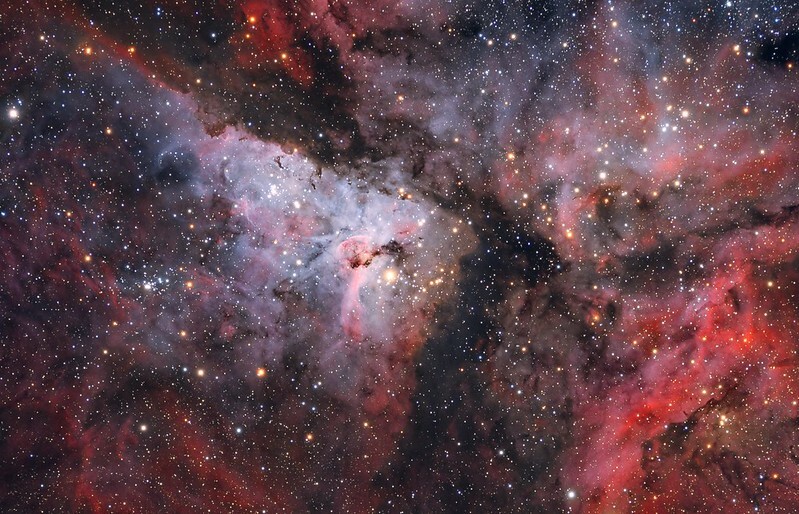 We really have to take advantage of all these red-emission nebulae while it lasts. Not too long ago, I hiked up the ski slopes of the Mont Jura mountains again to get this shot as Orion was setting in the early hours of the morning. I really love this view because it really highlights all the visible deep sky objects at 50mm: the Orion region just setting above the tree line, The Rosette nebula and the Chritsmas Tree cluster, the Hyades and Taurus, The pleiades, the California nebula, the dark dust lanes and the light from all the stars in the fainter outer arms of our milky way. I wouldn't have been able to get all those colors and details if it weren't for the combinations of techniques perfected over a long period of trials and mistakes. It is the result of tracking individual panels (2 rows of 3 pictures) at 50mm with a light pollution filter and an astromidifed camera. The very sharp and bright lens (Sigma 50mm f/1.4) also helped acquire some good data. I really do hope you enjoy the view. Derived from my movie 'Fall skies of La Palma', you can probably remember this epic scene where the core of the milky way- containing billions of stars, was setting above a sea of boiling clouds. Since I shot a time-lapse, I had a series of the same shots in a row that I just stacked together to increase contrasts, details and colors. At just 25 shots (after which the milky way core disappears too much under the horizon) you can reveal so much details in this particularly bright and colorful region. You dramatically increase the impression of three dimensional space, where the light coming from the downtown neighborhood of our galaxy is being blocked by a central lane of dark hydrogen clouds. In front of it and much closer to our solar system, previously exploded stars created nebulae like the Lagoon (large pink gas cloud) and the Trifid nebula (pink and blue nebula). Some will also probably recognize the brightest stars closest to us: Nash (left corner), Kaus Meridionalis (far left), Kaus Borealis (at the very top left), M23 star cluster. The brightest 'star' you see is actually Saturn setting at the same time as the milky way core. In its last moments before we are able to see it again (in the Spring), the central part of our own galaxy offers us such a colorful and bright last minute 'sunset' where in fact, billions of 'suns' set on the horizon. You mean that "very bright optical transient" was really Mars???? Yep, it is funny story, just how sometimes the pure enthusiasm blurs the mandatory data verification requirement. A 8 hours SHOrvb picture.